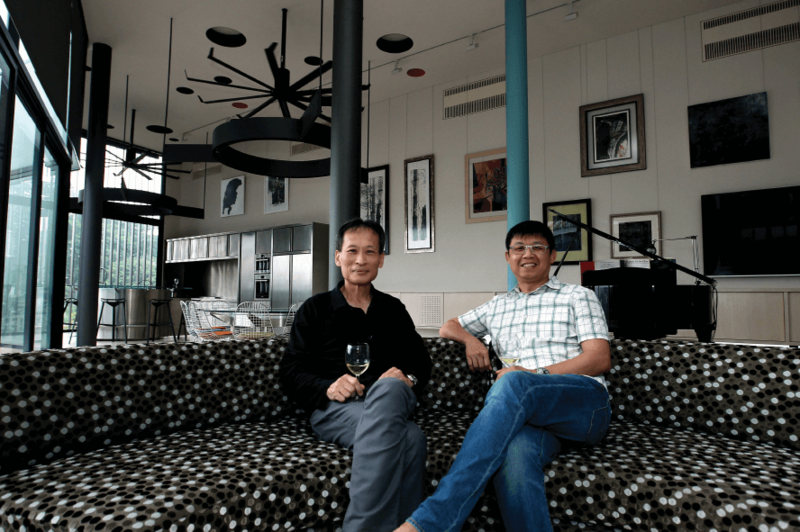 THE brief that Dr Wong Jun Shyan gave architect Frank Ling concerning the new house he wanted to build on a plot in Damansara Heights was clear — it is to be a thing of beauty that would stand the test of time. The resulting mansion well exceeded expectations. An architectural and engineering feat, the house defies easy categorisation and presents a study in well-articulated design. Colours are used as accents to great effect, on both the exterior and interior. The house is also a shining example of respecting the natural terrain and being environmentally conscious, with several green features incorporated into it including rain water harvesting, photovoltaic panels generating 12kW of electricity, the use of eco-friendly bamboo for flooring, and a herb garden on the roof, which not only adds greenery but also helps cool down the house. On the land sat an existing house whose design followed the natural slope of the terrain, meaning that the car porch and entrance was on the road level while the living and utility areas as well as bedrooms were spread over three floors that wound downwards. The homeowners wanted to do away with the old house, but Ling convinced them otherwise. So the old house was conserved, and its spaces reconfigured into the children’s study and recreational area on one floor, guest suites on another, and on the last floor, a wine lounge outfitted in recycled sherry barrel oak strips, along with a purpose-built cellar room for Wong’s wine collection. Previously, there was an outdoor swimming pool at the ground level but this was taken out and the whole area transformed into a garden with all kinds of ferns, shrubs and trees. The new structure takes inspiration from kampung houses in that it is supported by stilts in the form of massive steel columns and cross-beams. 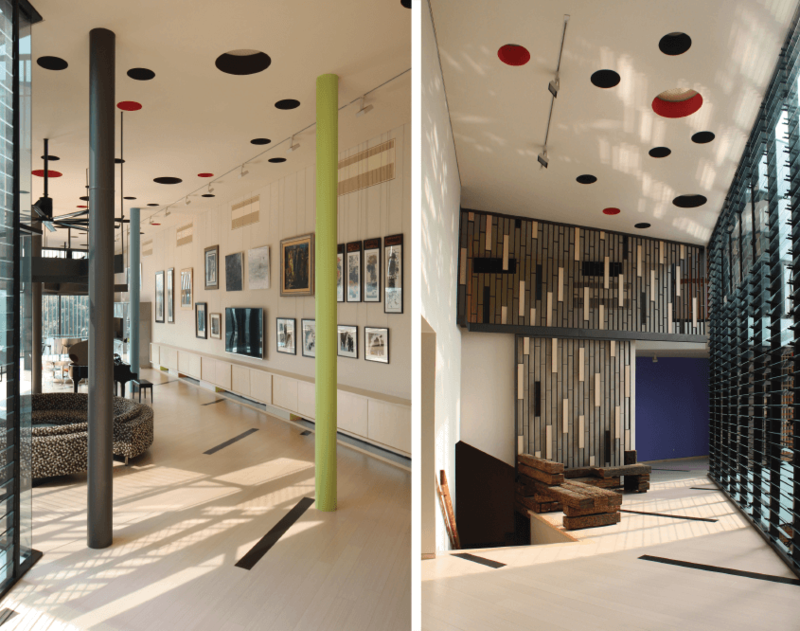 “We take the essence of what is good about a kampung house in terms of ventilation and lightness. It’s literally hovering on a hill when you look at it from the other end. But at the same time, we did not want it to be so vernacular, so very obviously Balinese or Malay,” says Ling. The new house is rectilinear with two distinct wings that extend out from the slope, while an outdoor, rectangular infinity pool and accompanying deck connect the two wings at the ends. The middle portion is left as a void, and this allows for excellent cross ventilation and convection. With the louvred windows opened, the house is airy and breezy and can actually make do without air conditioning. Much of the details in the new build — from architecture and lighting to furnishings — is carefully thought out and designed by Ling, who was given much freedom to exercise his creativity. 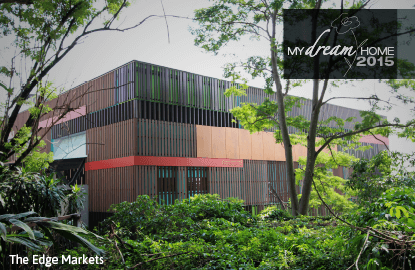 The façade is like a whimsical colourscape, comprising vivid hues of lime green, turquoise, fiery red and rusty orange, tempered with cladding that filters sunlight (thus reducing solar heat gain) and is also a design feature. 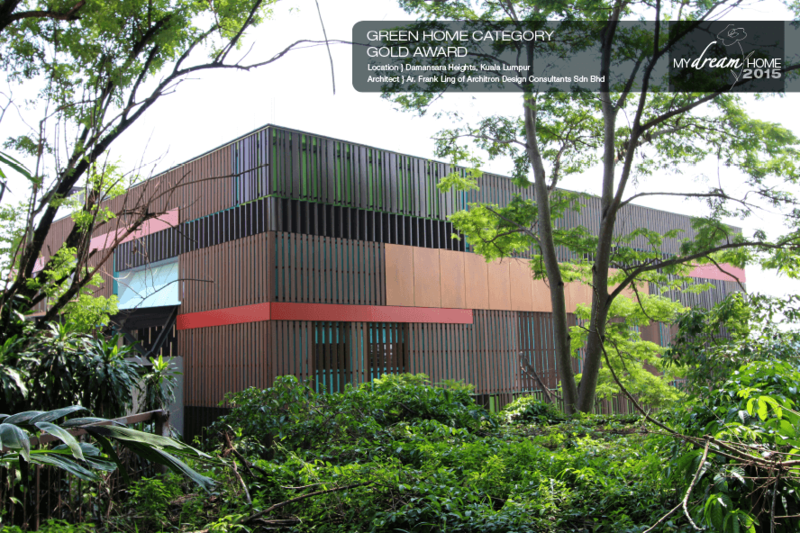 What’s unusual about the cladding is it is composed of five complementary materials, including coated aluminium panels, Japanese external flooring and Spanish composite timber panels — it affords an altogether unique textural effect. Eye-catching though it may be, the exterior gives the impression of being impenetrable and unapproachable, but this is not the case once you step inside. The interior sees a lot of soft, natural light during the day, thanks to floor-to-ceiling glass windows, many of them sporting a louvred design. The old house is accessed via the original staircase at the corridor, while the new house splits into two separate wings. Featuring a double-volume ceiling that gives it a sense of grandeur, the right wing is communal in character with the living, dining and entertaining areas seamlessly incorporated in the sprawling space. A black grand piano takes pride of place in the middle — Wong is proficient at playing and is known to entertain guests with a tune or two. 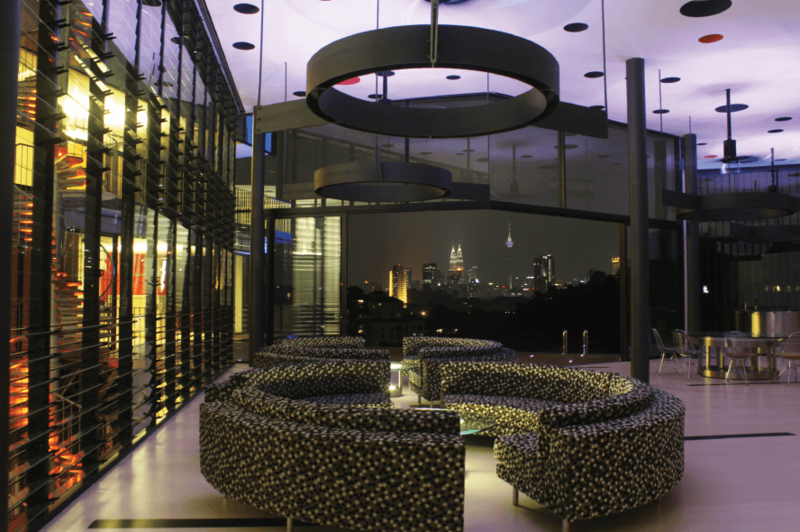 What quickly becomes apparent is the use of circular shapes, seen in the custom-made sofas upholstered in quirky polka-dot fabric, the frosted bubbles on the double glass entrance, the accents on the wooden hand rails, the 12-seater purpose-built glass and steel dining table, the spherical bar at the dry kitchen, the coloured acoustic panels (to eliminate the issue of echoes in the house) and speakers on the ceiling, and contemporary versions of “chandeliers” made from grey metal loops studded with LED lights. The round shapes have the effect of softening this irregularly shaped, angular space. The side facing the neighbours is walled up, with a row of small windows for light and ventilation at the floor level. This is to ensure privacy, and it also presents the owner with a large blank space to exhibit his eclectic art collection. The use of Erco lights — the lighting favoured by major museums — ensure the works of art are illuminated with a soft, diffusive glow. 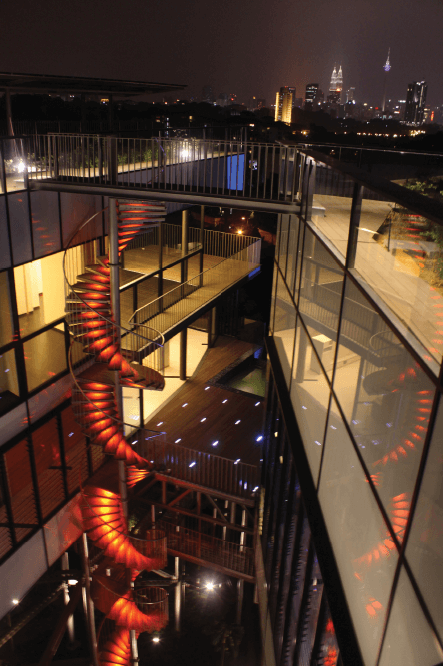 In fact, the lighting scheme for the whole house, in particular the outdoor areas, is gentle and subdued so it does not compete with the night-time cityscape. 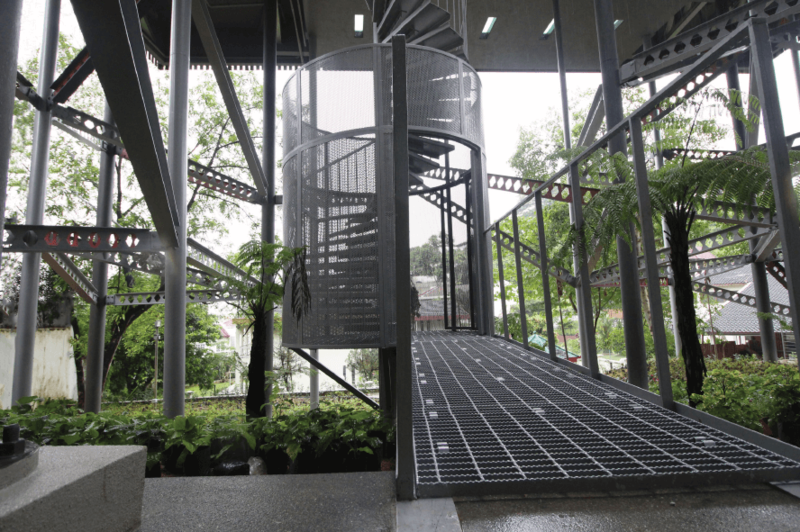 A spiral staircase that starts from the ground up leads all the way to the rooftop garden where local herbs and vegetables thrive. Ling says the garden has also managed to attract bees, a much welcome addition to the ecosystem. Clever configuration of spaces, a strong design language imbued with a sense of playfulness and fun — this is what this dream mansion is made of. The house took a long time to build due to various challenges faced during the process, but both owner and architect agree it was well worth the effort.